An authentic upscale gaucho style Brazilian steakhouse in Edmonton city. We are located on Saskatchewan drive with one of the best city views overlooking the walterdale bridge and city skyline. 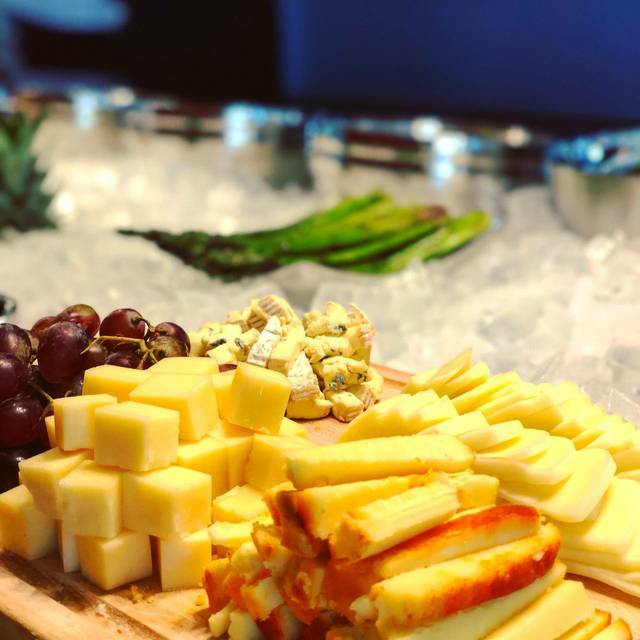 We offer variety of Brazilian grilled meats in an all you can eat meat concept meat being carved at your table side with a variety of hot, cold salad bar. There is complimentary guest parking available in front of the restaurant and adjacent side streets. 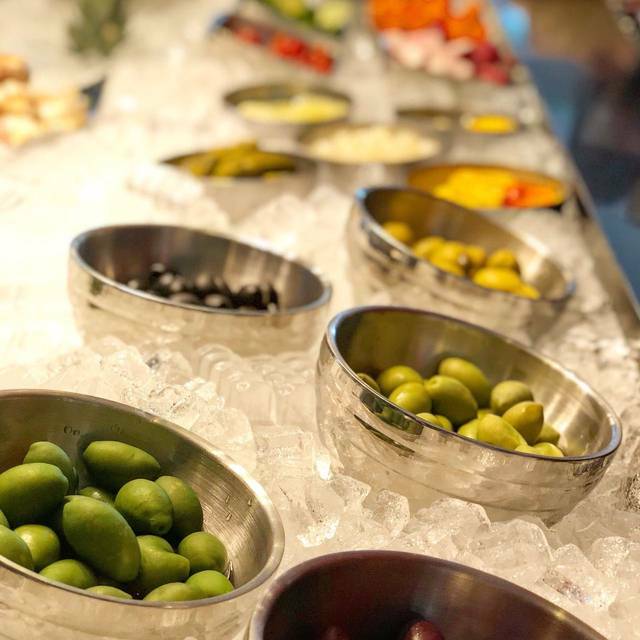 The newest addition to the Brazilian Steakhouse scene is phenomenal! We went for brunch and the value is incredible. 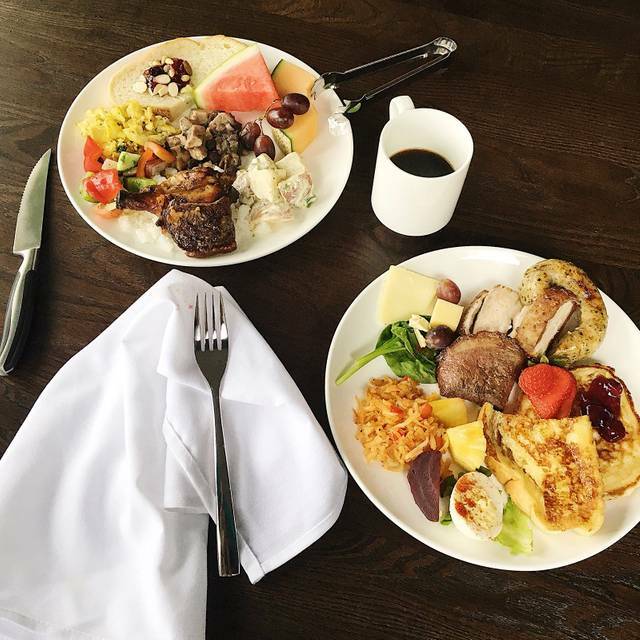 Seven cuts of meat were complimented by grilled pineapple, the side dish buffet, and traditional breakfast items you would generally see in a breakfast buffet. Service was great and the staff did not hold back their choice cuts of meat. We will definitely go again! The food and service were fantastic. The waiters were always ready to bring more extremely delicious food. The view of the city was great. We brought guests and we had the best time ever. lots of choices and the menu was filled with something for everyone. rump steak, shrimp and grilled pineapple were highlights of the evening. we will be back again and again. Hands down to one of the best steakhouse in edmonton. AMAZING FOOD AND SERVICE WAS GREAT. We will back soon. Highly recommend this place. Been Twice to this location now for brunch and the food was great both times, will have to try there dinner menu next. Great place for meat eaters. Side dishes are available on a buffet, fresh meat is brought to the table. The good: excellent variety of meats and side dishes. All you can eat. The short ribs were a stand out. Opportunities for improvement: ambiance is somewhat like a cafeteria and doesn't do the meal justice. Some of the cuts are a little tough. Great place with attentive service. We were a little surprised at how few people were there especially since Open Table indicated we couldn’t book at another time. There was ample room for lots more patrons. Wine was excellent and was half price. Highly recommend. Parking great! Beautiful view wasn't busy on an early Wednesday evening. The service was great and so was the food. Will definitely be back here! Service slowed down considerably after 7:30 but no one went away hungry. Good food, nice ambience. Come if you like meat. 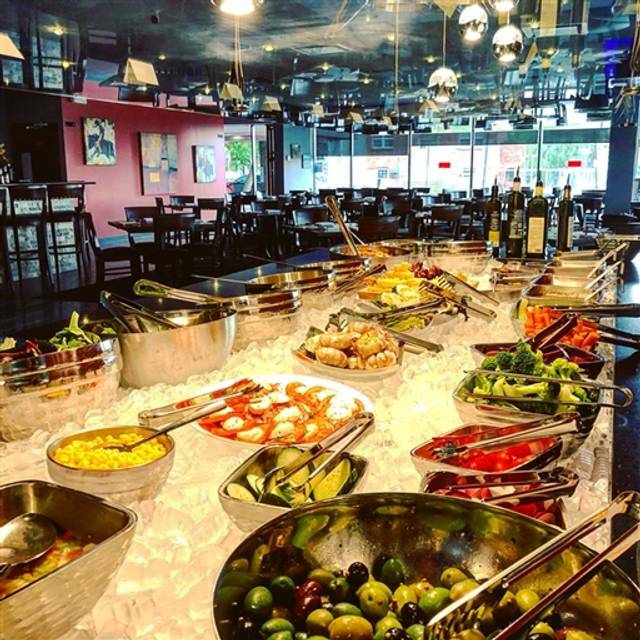 Excellent variety of rodizio. I love it, the food is really good. I will come back for sure. Very delicious food, friendly staff, beautiful ambience. Had a fantastic time! Very basic no frills restaurant. Lacking ambience. Amazing place to celebrate with a large group. We had a separate table that was great. Food came around a bit fast but it was all delicious. Our server Jeff was wonderful!! Thoroughly enjoyed the food, wine and ambience. Looking forward to celebrating there again! The meat was fabulous and always hot when brought to our table. Love the free parking, great view and the fact it was not chilly in the glassed-in area where we were seated. The tables were well spaced. I would have liked to have some of the higher cuts of meat brought out sooner. After we were there an hour and a half the meat my husband wanted, the lamb, came out after we had eaten already. The sausages came out too often I think for the price we paid. It is a very expensive meal for most people these days, costing what I pay for groceries to feed my family for 2 weeks, and I save up all year to go out for a special meal like this for Valentine's Day. I made the mistake of having the salad before the meal, which left me nearly full before the 2nd meat choice arrived. The food was amazing. It would be nice if you could have some type of discount for people who have eaten there for supper as an incentive to return for another evening, at maybe a 2 for 1 price. This would make us return over and over again, instead of only once a year, especially if one could register online for a deal like this on a birthday or an anniversary. Lovely food. Lovely evening. Excellent food. Too expensive unfortunately. Interesting concept of continuous meat at your table. Service was good except the desert took a long time to be prepared. The steamed vegetables were only lukewarm and there was no gravy for the mashed potatoes. Most meats were tasty, and the salmon and pineapple were nice. As always, good stael selection. Term and flavor excellent and great service. Loved the warm items for sunday brunch!!!!! Delicious variety of meats and salad bar; the grilled pineapple was delicious! Amazing food, everything they had was so juicy and perfectly cooked. Miles way better than pampa in terms of quality and low price. their grilled pineapple and rump steak were to die for. overall had an amazing time at fumaca with downtown beautifull view. This was our first visit, and we took a group of 16 to celebrate a birthday. There was not enough parking at the restaurant, and some of us had to park a few blocks away. The walkway in front of the restaurant entrance was very icy, and something I feel should have been taken care of. There was no hostess at the front to show us to our table, either. I called ahead to inform them that since we are such a large party, we would be happy to sit at two tables near each other. Instead we were relegated to a dark corner and the table was too large for the area. The servers had limited room to move, so much so that I ended up with an entire drink spilled down my back from our server having to lean too far forward. The side dishes were ok, but the meat was outstanding both in variety and taste. Be aware that most of the meat is cooked rare to medium rare. Someone at our table wanted lamb that was cooked just a little more, was told it would be cooked and returned to the table and that never happened. For people with food allergies, there are signs indicating potential allergens, which was a nice touch. Desserts all tasted great, but are very small portions for $9 and not worth it in my opinion. The drinks menu seems lacking in basics, and doesn’t even offer sparkling water. Overall we were very disappointed and will likely not be back. The food was amazing! The pineapple that was served at the end was delicious. We will be back! Exceptional service. Great selection of meat. well spent night at fumaca. our group had a great time. 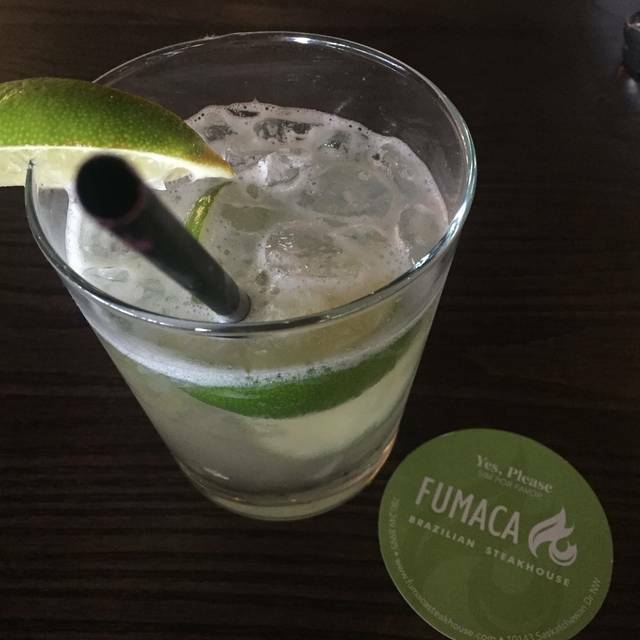 I enjoy Fumaca very much! It’s a great place to get together with friends and experience a wide variety of food. The staff is friendly. The restaurant is always clean and the atmosphere is always good! 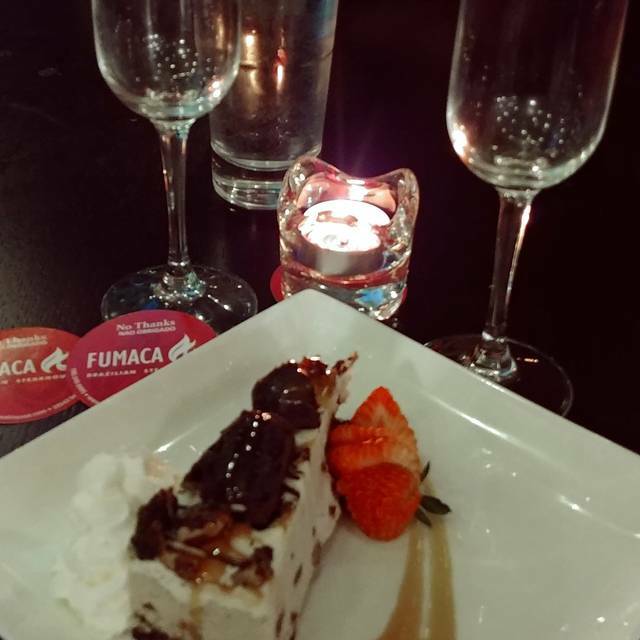 Spent another great evening at Fumaca with family. Their staff was friendly and professional as usual. we loved everything of their meat selection. Their specialty grilled pineapple and rump steak were just unbelievable. we will be back soon. My friend Mark and I came in right before they were about to close before preparing the for the dinner menu. Anoup was courteous, never rushed us and was attentive the entire time. The food is just as good as Pampas, if not better, at a reduced price. Definitely plan on coming back to Fumaca anytime I feel the urge for Brazilian Rodizio! We had a great time celebrating my dad’s 60th Birthday! They had kid friendly options, and our server was friendly and open! The sorbet and créme brûlée for dessert were amazing! Always have amazing food. Love coming here with just my spouse as well as other couples. Really good! Definitely a great place and fierce competitor to another Brazilian place in town. Salad bar was fresh and had a nice selection. Come hungry! You’ll eat a lot! I came here with friends on a Saturday night. I made reservations online but did not need to because there were a lot of tables available. We were there for approximately 3.5 hrs. The meat was superb and very tasty. Salad bar had enough choices of cheeses, salads, and dressings. After all, we came here for the meat. Ambiance was great. Low lights, cozy, and very comfortable. Loved that we could see Edmonton's skyline. Service for the meats was great. My only complaint is our waitress. I ordered a cup of coffee after our meal. She brought the coffee but never came back to top it off. I supposed I could have flagged someone but at $45, I expect superb service. Our family went to celebrate a birthday and it was a fantastic evening. The service was exceptional; attentive, kind and generous. The food was outstanding; cooked perfect and very delicious. Our host, Jeff, made sure we were happy. A surprise sparkler was even added to our dessert. We highly recommend this restaurant. The view of the downtown lights was so pretty and I look forward to coming to eat on the patio in the summer. Thank you for a great evening. Had a table with amazing downtown view. we really loved this place. All the meat cuts we tried were cooked perfectly. we didn't know they have seafood and pineapple in same price that was awesome. Their staff was so good as they were cooking meat according to our preference that was rare to see in other Brazilian steakhouses. we can highly recommend this place to our family and friends.